weber_cam: What the hell is happening to me? It all started when I put on my Ithaca Farmer's Market t-shirt this morning. Coincidentally, I've been somewhat obsessed lately by Heidi's caramelized tofu. She writes one of the most creative food blogs there is. It all came together tonight when I made her dish with her suggestion of adding brown rice. A one-pot meal that is now a permanent part of our repertoire. Here's my recreation of her masterpiece (my photography isn't nearly as good). 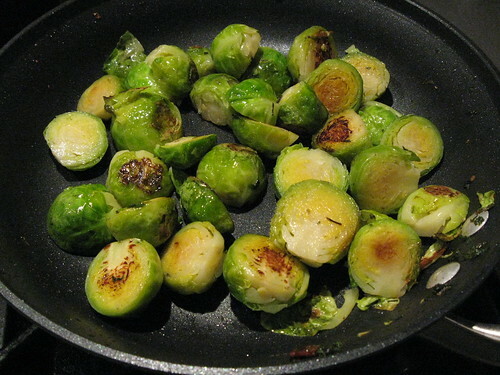 I also tried a new method for cooking the brussels sprouts. I usually roast them. Sometimes, however, they achieve a nicely caramelized outside, but are underdone inside. Cook's Illustrated once described a method of cooking hash browns in a skillet; first the raw potatos were steamed covered and then browned with the cover removed. 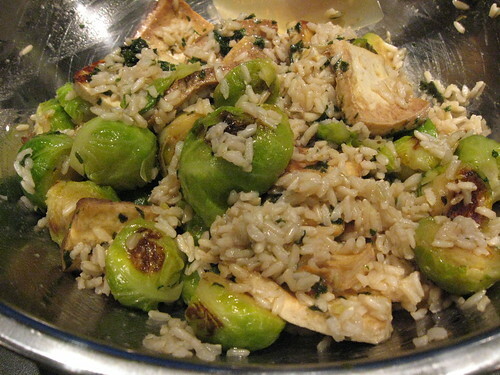 I applied this method to our brussels sprouts for this dish and they were superb. Tender on the inside and the exterior crisped nicely. Here they are. A good night for cooking - Thanks for the inspiration Heidi.